A view of the Northern Navigation Company steamboat MONARCH after it was wrecked of the shore of Isle Royale. A black and white photograph of the MONARCH on a divided back postcard. 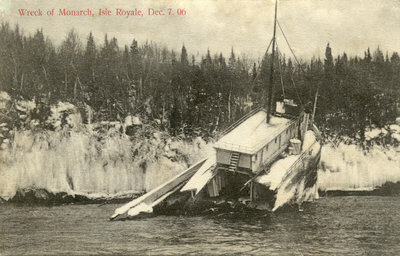 "Wreck of Monarch, Isle Royale, Dec. 7. 06"
Reverse: "Published by W.T. McKachren."